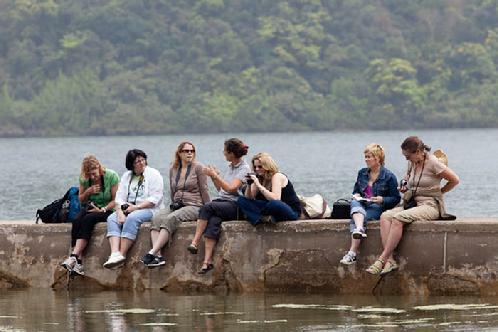 photography courses, photography workshops by Jackie Peers, Hong Kong. Hong Kong photography courses and tours are offered by Jackie Peers, a Hong Kong based photographer with 15 years experience, she runs Walk Hong Kong's photography workshops which are proving very successful. One of Jackie's passions is the abandoned villages of Hong Kong - the photos below are samples from her recent exhibition here in Hong Kong. She lives in Sai Kung Country Park and has an intimate knowledge of its most picturesque, remote and photogenic corners. Another of Jackie's favourite locations for her photography tours is the vibrant backstreets of Kowloon. If you're looking for a photography course, photography workshop or just a some quality time with your camera, then Jackie can accommodate your needs. These outings can also be booked as personlaised photography tours. Jackie caters to all levels of expertise. Some people may have just made a new purchase and are keen to put it to use. Others may have owned a good-quality camera for some time without ever fully utilising its features. Still others may be expert photographers requiring no technical guidance at all, but just seeking wonderful locations very few visit. Whatever your background as a photographer is, you can take advantage of Jackie�s local knowledge and 15 years as a professional photographer and join her on a day out in Hong Kong. After assessing your level of expertise with the camera, she�ll set you some tasks to do. Jackie�s enthusiasm for photography and a setting that includes both natural landscapes, old indigenous villages of Hong Kong or the backstreet markets of Kowloon, guarantee a great photographic day. Tap Mun Chau, one of the remoter corners of Hong Kong. The setting of this photography workshop includes both natural landscapes and old indigenous villages of Hong Kong. We explore the Tin Hau temple, walk around the rugged coastline, check out the balance rocks, walk through the fishermens village, and compare the hats of the Hakka (land folk) and the Tanka (sea folk). On arrival at Sai Kung at any one of the three bus terminals you will see the waterfront (1min walk); make your way here and you will see two piers. We meet at the entrance to the shorter of the two. If you use any other form of transport, make your way to the waterfront by the bus terminals, and the pier is right in front of you. Let me know what area in Hong Kong you are coming from and I will give you the quickest route. Facilities: Toilets en route, and refreshment stops available. Picnic lunch can be purchased in Sai Kung or we can use one of the local restaurants on the island. Our photographic tour takes you through the back streets of Kowloon and into the daily lives of local residents. We thread through colourful streets and come across some of Hong Kong’s most lively markets and well-known landmarks, where you will feel first-hand the energy and soul of everyday Kowloon. As we photograph, you will be immersed in the living culture of the Yau Ma Tei and Mong Kok districts - two of the most densely populated spots on earth, and where much of daily life is lived at street level. This is a great location for street imagery. Facilities: Toilets en route, and refreshment stops available. Local-style lunch can be purchased on tour. Chek Keng, east Sai Kung Country Park, Hong Kong. 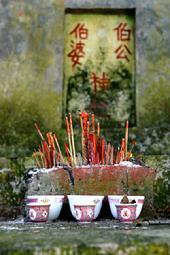 We can explore the historical village of Chek Keng. A wonderful treasure trove for a Photographer - though deserted, it is not truly abandoned as some former villagers occasionally return to check on their ancestral homes. 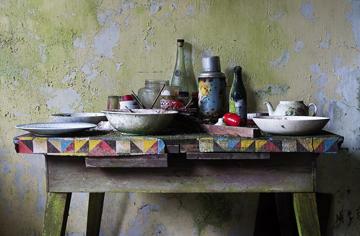 Furniture and cooking utensils stand still in time, as if one day life in some of these homes might be resumed. With so many festivals and celebrations in Hong Kong we can often coincide our tours with one of these special events. To explore some of Hong Kong’s more secret corners, we can hike to spectacular coastlines, feng shui woods and villages with their remaining inhabitants that really do seem like a land time forgot. Please email with any enquiries about individual tuition or small group, one-day photography tours. Comfortable clothing, shoes (think water/mosquitos - so long-sleeved clothing is good). Camera/lens, some form of carrying case that is also weatherproof. Manual if you need assistance with understanding your camera. Memory cards - available space. Notebook/pen for general recording purposes. We do not provide lunch, snacks or water on the trips, but we take you to places you can purchase these, or bring your own picnic with you. Or we can eat at a local restaurant. If coming from HK Island, using the MTR take the blue line (Island line) towards Chai Wan, change (cross the platform) at North Point to the purple line (Tseung Kwan O line) towards Po Lam. Hop off at Hang Hau, follow the signs to the mini bus stops (right next to MTR building). The 2nd line in, in about the middle of the row, is the bus to Sai Kung. Bus no. 101M (if unsure just ask) - stay on this bus till the very end. The jetty is very close to this bus stop, walk to water and it will be slightly on your right. If coming from Kowloon side, using the MTR take the red line (Tsuen Wan Line) towards Tsuen Wan, change (cross the platform) at Mongkok to the green line (Kwun Tong line) towards Tiu Keng Leng. Hop off at Choi Hung, go to Exit C, (follow the green mini bus signs to Sai Kung), once at Exit C take the first right (Exit C1). Go up the ramp, then double back on yourself and walk to the first line of buses - they also say Sai Kung. Bus no.1A - stay on till the end.